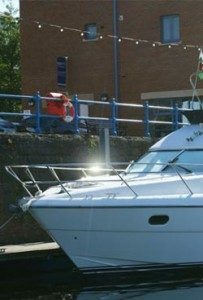 You only have to wander about the club compound or Milford Marina to see how popular motor boats are, whether they be speed machines for water skiing, slow and steady for fishing or simply a boat to take the family exploring the Haven and Islands. Motor boats come in all sizes and most are multi-purpose so can provide an inexpensive and easy way to enjoy boating. The smaller boats can be safely launched and recovered from the Gelliswick slip at most states of the tide and the club has washdown facilities for the boat and showers to wash the sand off yourself too! Large and small boats can be moored off Hakin Point, Conduit and Gelliswick areas which the club administers for a nominal fee and you can leave your tender in the compound and have a drink afterwards. The larger boats can also be hauled out and stored in the club over the winter with water, electricity and waste disposal to aid maintenance. This year the club hopes to organise a fishing competition. If you think you could organise one then please contact a member of the committee who’ll be able to help with logistics, advertising and prizes. You just need to make up the rules and suggest a date!